PHOTO: Allen Ramsey, DWCPhoto.com. Highlands sophomore Finn Murphy fires toward the water in the Region 5 Boys Diving championships at Scott High on Saturday. Murphy qualified for state with a overall score of 496.05. 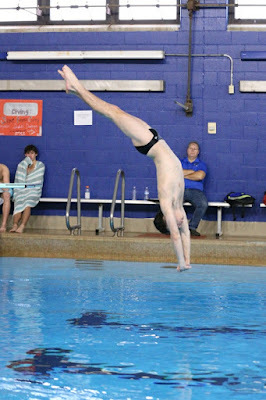 Murphy finished runner-up to St. Henry diver Aidan Stigall's 504.35 points. When the sun started to go down, the Highlands Bluebirds boys swimming and diving teams made sure the Region 7 gold trophy came with them back to Fort Thomas. The Bluebirds dominated the event at Silverlake from start to finish capturing their first region title since 1994 and ending Covington Catholic's run of 19 straight region championships. The Bluebirds scored 508 points and CovCath finished second with 381. "On Friday, you had to qualify in the top 16 to score points," said Amanda Johnson, Highlands Head Coach. "On Friday, they really did their job. The amount that qualified both boys and girls. They put us in a good position for Saturday's finals. They did awesome." The Highlands combined squads also won their seventh straight region championship scoring 760 points. Dixie Heights finished second with 642. "Dixie Has really strong boys and girls teams like we do," Johnson said. "It gets nerve-racking. We don't want to lose that title. That's another thing we have to think about going into regionals." The Highlands girls took fourth with 252 points. Notre Dame won its 20th straight region crown with 412 points. "I feel our program specifically for the girls is a lot younger than we used to be," said Savannah Brady, Highlands senior swimmer. "But the boys team has grown a lot now that they're all in high school. I feel it's like it's been cool to watch them win regionals for the first time in a while." Highlands sophomore diver Finn Murphy started the day with a runner-up finish in the one-meter diving competition with an overall score of 496.05. St. Henry's Aidan Stigall took the championship with 504.35 points. Murphy tied for first with a 455.15 in the same event last year and finished state runner-up with a 389.35. Orangetheory Fitness, located in the Newport Pavilion. Teams performed 11 dives if they made it to the finals. Murphy said his most difficult dive was an Inward 2.5 Flip. It's difficulty is a 3.1 which is the most difficult one possible in the one-meter dives. "I try not to worry about the other divers so I just think about myself and I don't worry about the score," Murphy said. "I had a few sloppy of dives that I do think that I can do a lot better. I think I'll pull through at state. I really have to step up my game." The Highlands boys dominated the relay races winning the 200 freestyle in 1:28.56 and 400-yard free in 3:11.82. and finishing second in the 200-yard medley relay in 1:39.8. The 200 freestyle relay consisted of senior Garrison Herfel, freshman Mac Russell, Will Griffith and Jake Ryan. The 200 Medley Relay consisted of Ryan, Griffith, freshman Jack Banks and junior Brendan Conley. The 400 Free consisted of Russell, Griffith, Conley and Herfel. Herfel won the 50-yard freestyle in 21.63 seconds and Russell finished runner-up in 22.51 to advance to state. Herfel also won the 100 freestyle in 48.54 seconds and Russell finished second in 48.82 with Griffith (49.96) and Ryan (49.98) following just behind at third and fourth respectively. Conley won the 200-yard freestyle in 1:43.5 and sophomore Caroline Sand took second on the girls side in 1:53.32. Conley also took second in the 500 freestyle in 4:43.28. Sand also took second in the 100 free in 51.84 seconds. Sand broke school records in the girls' 100 and 200 free. "The junior and senior class has been waiting a while," Johnson said. "We've progressively gotten better as they've gotten older. They've wanted to win the region. This was just our time. They just really exceeded expectations." Junior Olivia Hopper also broke a school record on the girls side in the 100-yard Backstroke. Hopper swam it in 59.65 seconds good for fourth. Johnson did receive another coaching award. It was the Region 7 Boys Coach of the Year for the second straight year. The state meet runs at the University of Louisville from Feb. 22 through Feb. 24. The diving prelims are Feb. 22 and the swimming prelims the following day with the finals take place on Saturday the 24th.